Yeah, the story's as bad as it sounds. The Holidays always seem to bring out some truly stunning stories of human greed, and this year doesn't seem to be an exception. Recently, in North Carolina, a thief broke into a medical center and stole a number of game consoles that were intended for kids who are recovering from cancer. 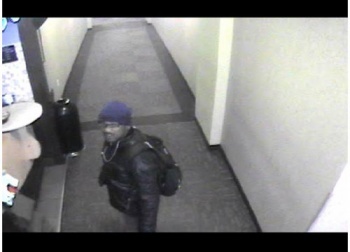 The guy pictured here broke into an office at Carolinas Medical Center Campus and stole an Xbox (original or 360 hasn't been clarified), as well as four other consoles. As you can see from this photo, the thief wasn't terribly bright and actually looked at this security camera; many other cameras caught him on tape, too. Authorities in Charlotte, North Carolina, are searching for this thief. According to a police news release: "We are definitely making every attempt to get these gaming systems back to the young patients at Carolinas Medical Center so that they won't be deprived much longer from playing their favorite video game while enduring treatment for their illnesses." This is one of those stories that makes me pretty angry to write. Stealing stuff from kids is bad enough, but stealing from kids with cancer means that there's a special circle of Hell reserved for you. When they catch this guy, I hope they throw the book at him.